Surface water bodies are one of the irreplaceable natural resources for human survival, and it extensively reduces with increasing the world population. 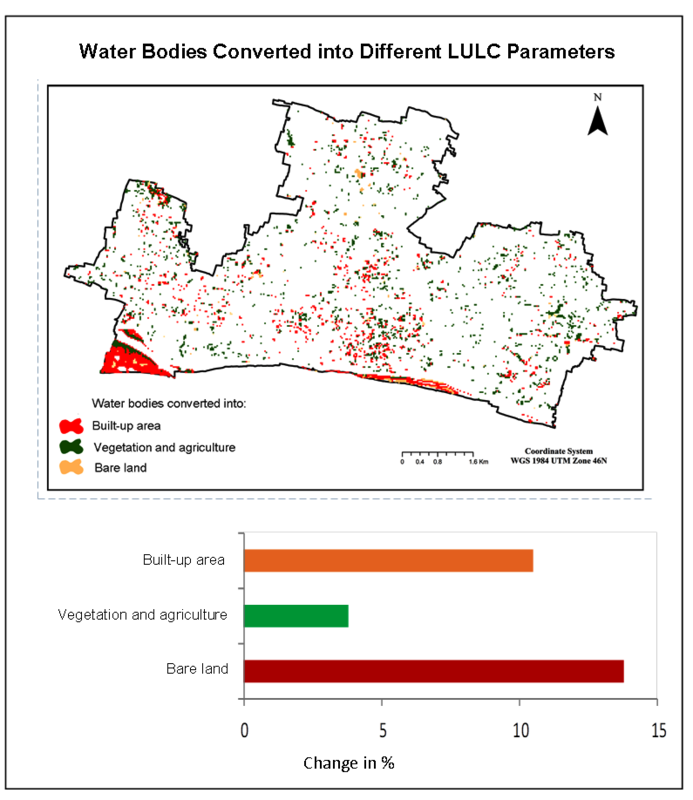 This study modeled the spatiotemporal changes of land use / land cover (LULC) and identified the most influential LULC parameters, which contributes in the reduction of surface water bodies using the Landsat 4 and 5 TM and Landsat 8 OLI images (1992-2017). Rajshahi City Corporation is situated in the Northern piece of Bangladesh. A maximum likelihood supervised images classification algorithm was used for detection of changes in LULC. Matrix union technique was used for identifying the prominent LULC parameters. About 14% of water bodies were filled up in twenty-five year (1992-2017) due to rapid urbanization in Rajshahi City Corporation area. This study can provide an essential move towards necessary actions for preservation of surface water bodies to maintain the ecological balance and environmental sustainability. Surface water bodies are reducing at rapid rate in Rajshahi City of Bangladesh. Remote sensing and GIS technologies were used to estimate the water body reduction. Around 14% of water bodies were filled up in 25 years due to rapid urbanization in Rajshahi City. Findings are useful to the policy and decision maker for sustainable surface water management.